This is the biggest smile I think I've ever been photographed with. And with food in front of me, it's pretty obvious why. 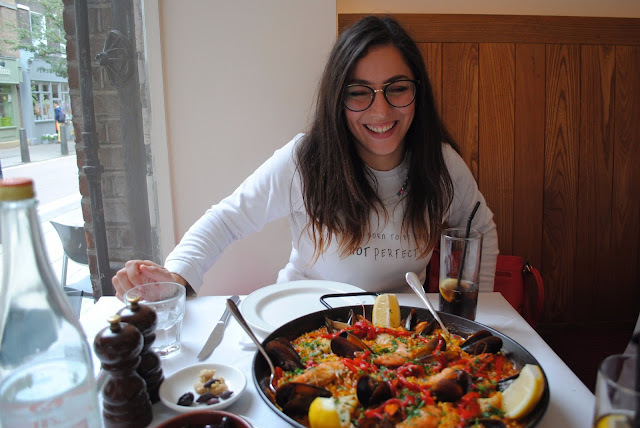 A couple of weeks ago, Ana invited me to come along with her to review Cigala, a Spanish restaurant in a corner of London I'd never visited before called Bloomsbury (near Russell Square). I've never reviewed a restaurant before but was excited to try new food and share my opinion on it. I felt a little bit like the guys on Master Chef, haha! The day before Ana came over mine for a sleepover and after getting ready for the day we head off to the station to make our way into London. From King's Cross it was a short walk into Bloomsbury and with help from our iPhone Maps we managed to get there pretty easily. Ana and I didn't really know what to expect so we had no expectations but to review what could potentially be some good food! When we arrived at the restaurant, we found ourselves outside a building with indoor and outdoor seating, clear signage and glass windows all the way around. It looked welcoming for the warmer days in summer but it was a bit colder that day so we were seated inside by the waitress who greeted us at the door. We sat in the furthest corner by the window so we could people watch. It was on a quiet street with no cars driving past because it was a closed road. It was quite lovely to be somewhere so beautiful and quiet in an a pretty hidden part of London. Inside the tables were all well set and ready for the day. The tables reminded me of the ones in the restaurants in Portugal covered in special paper to keep the table cloths clean and tidy. I liked this, it felt very homely considering my past experiences with restaurants back in Portugal. The waitress was very lovely and gave us the drinks menu to start with. Ana and I both settled for bottled coca-cola. After that we were given the main menu where we'd select our starters and main course. After settling in with our drinks, Ana and I checked out the menu and decided on some starters. To get the most of our meals Ana and I decided to order two different starters and share them since we couldn't decide between the two. We ordered Chorizo A La Brasa, Chicken Croquettes and we had some olives on the side as well. The presentation was simple and effective. Three chicken croquettes in a rectangular bowl and two chorizos on a bed of breadcrumbs and vegetables. The chorizo was a definite favourite for both of us. The taste took me back home with a little spice and that distinct chorizo taste. The chicken croquettes were very lovely too. They were creamy chicken and sauce filled on the inside and crunchy breadcrumbs on the outside. It reminded me of a really good mini chicken kiev - but in the best way! I would definitely struggle to pick from these two starters again. After we finished up with our starters, we went on to our mains. If the mains were going to be as good as the starters, I was going to be a happy Cat. I was excited at this point because Ana and I ordered Paella de Marisco to share. We both love our seafood and I don't often eat it out due to it not being some of our friends and family's favourite, so we were both looking forward to some good seafood. When the paella arrived we were AMAZED. Not only was the presentation beautiful, it smelled amazing and my excitement was beyond containment. I refer you back to the first photo of me. I was laughing so much at how excited I was about this food! The other thing was, was that this dish would serve 3-4 people. It wasn't long before we dug in. We took our pictures pretty quickly to be able to fully enjoy this dish to the fullest! If you're a lover of seafood, prawns, mussels and monkfish then this is for you. All these things in a bed of rice and vegetables worked together beautifully to create this amazing dish. Everything was cooked perfectly from prawns to rice and I honestly don't think I've enjoyed seafood out so much in the UK. There was so much food and we didn't manage to eat everything either, but we were very much full so its perfect for big eaters. I actually thought that John might like it here because they do a chicken and chorizo paella and he is a big eater. After filling up on this amazing paella, Ana and I ordered some desserts to finish our meal off with. I ordered something called Sopa Ingles (which translates to English Soup) and Ana ordered Homemade Vanilla Ice Cream. My Sopa Ingles was no my favourite. It was a sherry trifle with custard, banana and syllabub and wasn't particularly to my taste, but I'm glad I at least tried it. I didn't finish it unfortunately but I know that I won't be ordering it next time. Ana's ice cream was nice but she did say it wasn't anything special. We both agreed we enjoyed the starters and mains so much more. So the question now is: would I recommend it to you? And would I visit again? The answer is 100% yes. Though my experience with the desserts wasn't my favourite, I really loved the starters and the mains; They were delicious and cooked to perfection. The restaurant is well laid out and the staff were all very lovely too but I did think that the place needed a little more ambience with a little background music. But maybe it's something they do in the evening when it's a little busier as we went around midday when it was quieter. I did although really and fully enjoyed my experience and food there and am thinking about taking John there for lunch or dinner soon. I'd like to thank this lady again for letting me join her to experience Cigala with her and for a fun afternoon out. It was great food, great company and overall a great day. Thank you Ana, and thank you Cigala! If you'd like to see more information about Cigala and their menu, you can visit their website here.